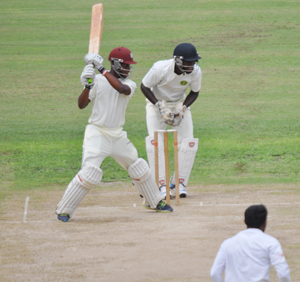 Shemron Hetmyer cuts Bajan Raymond Reifer to point boundary yesterday. Royston Crandon, who fell four short of his hundred to spur Vishaul Singh’s X1 to a respectable 311-6 by the close of the opening day of the second and final four-day practice match to select the Guyana Jaguars team for the inaugural West Indies Cricket Board (WICB) Professional Cricket League Regional Four-Day Franchise Tournament which starts on November 14. West Indies under-19 left-hander Hetmyer played with refreshing maturity in a wonderfully constructed even ton which was decorated with 12 fours and a six while Crandon’s attacking 96 also included a dozen fours and a six before left-arm Test spinner Veerasammy Permaul followed up his 6-126 in the first match at Bourda by taking four wickets in the last two sessions to end the day with 5-74 from 25 overs to stage a fight back from Leon Johnson’s X1. Singh’s X1 opted to bat on a track with a ‘tinge’ of grass and got off to a slow but solid start on a slow pitch which is already starting to keep low. Kandasammy Surujnarine and Taignarine Chanderpaul put together 40 in 17.5 overs on a day blessed with glorious sunshine before Chanderpaul (16) pushed forward to Permaul and was trapped LBW. Hetmyer joined fellow Berbician Surujnarine to take their team to 76-1 by Lunch and after the interval Hetmyer rocked back and cut Bajan left-arm seamer Raymond Reifer disdainfully behind point for four while Surujnarine delightfully swept Permaul to the ropes to bring up the 100. Royston Crandon punches off the back foot during his 96 yesterday. Crandon hammered left-arm spinner Gudakesh Motie back over his head for four while Hetmyer danced into Motie and dumped down the ground to reach his 50 with six fours and a six and celebrated with a scorching sweep next ball which reached the boundary like a shot from a gun. The partnership progressed with Crandon greeting Narsingh Deonarine with an explosive straight hit for a one-bounce boundary but Deonarine, picked more for his batting, looked the best off-spinner on show displaying subtle flight and turn at a time when most of the local spinners bowled too flat. By Tea, Hetmyer (79) and Crandon (49) were well entrenched with their team on 198-3 and the partnership already worth 85. 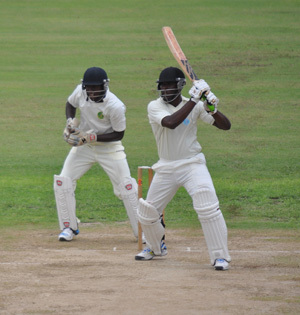 After the break, conditions became overcast and Chris Barnwell was smashed past point when he provided Hetmyer with width as the 17-year-old galloped into the 90s before Crandon got to his fifty with a single to long-on after reaching the boundary six times and clearing it once. After tucking a single to short mid-wicket to bring up his 100, Hetmyer seemed to relax on reaching three-figures and threw his wicket away with a rare rash drive off Barnwell and skied a catch to Deonarine at mid-off to leave the score on 232-4. Crandon continued to ooze confidence, pouncing on anything loose and a back foot punch off Deonarine was simply majestic. As the sunshine returned in all its brilliance, new batsman Chanderpaul Hemraj genuflected and caressed Reifer who was steady but went wicket less from 17 overs, for a delightful boundary. Crandon spent a long time in the nervous 90s before he was bowled by the impressive Permaul at 306-5 and the promising 74-run fifth wicket stand had been finally broken. With four overs left in the day, Steven Jacobs (0) missed an ill-advised sweep at Permaul and was struck in-front without addition to the score. Hemraj remained to close unbeaten on 39 and with him is Ricardo Adams yet to score as Permaul orchestrated an afternoon fight-back while Reifer must be learning fast that bowling pace at the Providence Stadium is hard work. Today is the second day and play is scheduled to commence at 09:30hrs.